An innovative lighting scheme designed by Cityzen was recently entered into the 2015 Lux Awards – the ‘Education & Healthcare Lighting Project of the Year’ category. This lighting award ceremony recognises people who are doing great things with low-energy lighting. 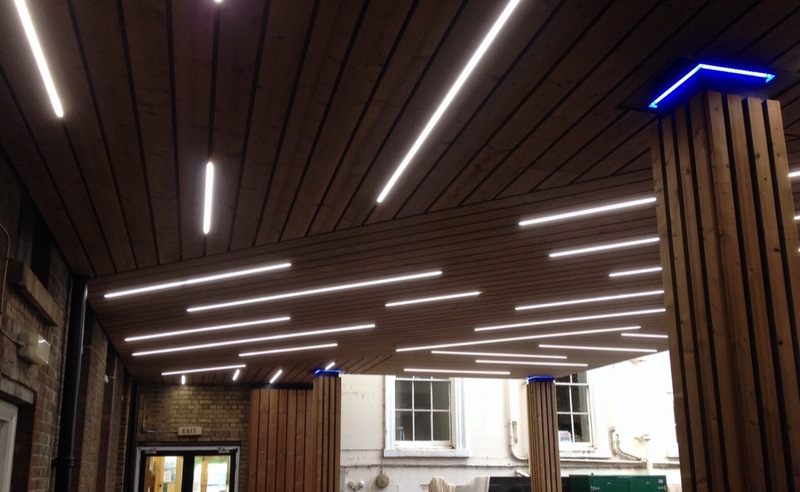 Earlier this year, John was asked to develop a lighting scheme for an undercroft that linked one part of Eaton House School (London) to another. Cityzen was already part of the team who had built a new extension over this area, and the undercroft was to be a walkway that would be used to gain access to the school’s theatre from another building. The client wanted something fun and creative for the space, which could otherwise have become dark and oppressive. So the challenge was to develop a scheme that would not only light a dark utility space, but also inspire its users: staff, school children and parents. Budget and time constraints added to the pressure of getting the right solution installed and tested within a two week period over the Easter holidays, so it would have been easy to just use a standard lighting design. Innovation was key to this project, both in terms of the layout and design. A cost-effective design for the undercroft was proposed, which used timber strips that created angles. This provided the perfect opportunity for Cityzen to design a randomised lighting pattern. The lighting scheme utilises LED strips in a broken pattern within aluminium channels between wooden slats, together with colour change LED strips at the top of each column. The scheme makes use of sensors and controls to ensure the system only runs when required, lowering overall running costs. The colour change is controllable via phone app and wall-mounted controllers, allowing school staff to control the atmosphere themselves as required. Staff at the school – and the project team – are very happy with the end result, giving lots of positive feedback about the space. John is proud to have created an inspiring space and we hope it will instil creativity into future generations!